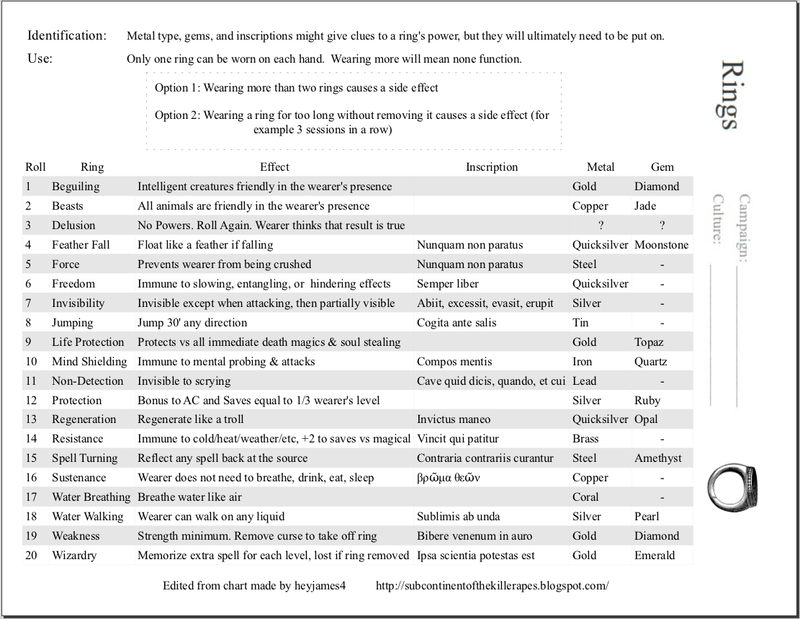 First, you should check out the great posts by heyjames4 on rings here, here, and on wands and staves. I took what he did and tweaked it for my own campaign. Here is a pdf and here is a file to edit to your own taste. So, in trying to differentiate magic items into distinct Gygaxian building blocks, rings are different in that their effect is infinite. Any ring with charges should be a wand. Because of their always-on nature they are the magic item best for contingency-like effects. I think Feather Fall is the quintessential magic ring. Once I realized this, I invented a ring of Force that produces an impervious forcefield around you when being crushed. The idea is to provide protection against deadfall traps the way Feather Fall does against pits. I also ported the amulets, Life-Protection, and Non-Detection to rings. I like the X-Ray power but think it should be some crude spectacles a character has to wear. I took out Telekinesis because it just seems to damn powerful. Maybe it will feel better to me as a charged item like a wand. I think invisibility is pretty damn powerful too and should probably be a potion, but I can't escape the tradition of the One Ring. I did duplicate the Water Breathing power that I had previously as a potion, because it seems like a good one to be able to use continuously. Maybe I can replace that potion with something else to keep the lists distinct. Rather than side-effects, I thought inscriptions might be more appropriate for rings. I plugged in a few Latin mottoes, but you could put in riddles or Esperanto or whatever. I have to give heyjame4 props, I never thought of a ring made from mercury and the image of the ever-shifting stuff around a finger is cool. A couple ideas for rings that this page doesn't get at: 1) Harmonious or negative effects when two ring types are worn together, so for example, you put on a Ring of Non-Detection at the same time as a ring of Invisibility and you become ethereal (but that could be as many as 400 possibilities! ), and 2) ring pairs that function together. ze Bulette's portal rings spring to mind, my rings of the joined, and heyjames4's idea which I call: Rings of Friendship: pool HP with the person that wears the other ring. 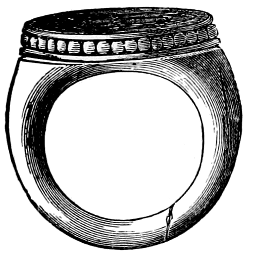 Rings with different effects when worn on different digits. The One Ring is a freakin' artifact, check out the side effects! I love the work you're putting into this series. Will we see One-Page Rods, Staves and Wands before the week is out? @Roger: Wasn't The One Ring inspired by something from the old Norse epics? There was an "Ear" Ring in the Cyclopedia, wear one and put the other up to a door to hear what's on the other side. @ Elber: I did the history of rod/staff/wands on my site, Telecanter linked in this post. Most traditional staffs & wands are just spell-casting platforms like scrolls, and rods are mostly miscellaneous magic items that you have to hold and may also be weapons. @Elber: Thank you. As heyjames4 mentions, they are kind of a mixed bag. I think I might have diseases done next, or the dowsing wands, which are easier than the charged spell items. @hj4: I might post on building block next. I think some of those essentially act like rings, or potions, some may be a different breed of item. @Omega: Thanks so much for letting me know. Knowing someone else might get some use out of these is part of the fuel that keeps me working at them. Another classic use of rings and other jewelry: soul traps. The gamut of these is pretty broad, including captive genies and devices for controlling the mind of the wearer (or something like "fate control" in the case of Rosemarie's Baby), but my favorite is Ming's ring in the 1980 Flash Gordon movie, which seems to act like a kind of save-game for him, absorbing his essence so that, it's implied, he can one day come back. This might break your building block, because it's effectively a ring with a charge, if the trapped soul has any means of getting free. I'll leave my non-rings comment on your non-rings post. Regarding powerful effects, I'm in favour of pairing them with some extra effect that tempers them. The One Ring's a good example: the invisibility there was nicely tempered by adding a klaxon effect for ringwraiths and Sauron. So what about rings of invisibility or etherealness or whatever that don't work on magical creatures or that make you visible/attractive to undead? There's also the whole genre of monsters that can only be hit by magical or astral or whatever weapons: depending on what it really did, a ring of invisibility might make you capable of grappling those creatures. Because it's resolutely game-mechanical and cheerfully just messes with the building blocks it has without many genre limitations, Pokemon is a great potential source for powerup effects. The variables there are essentially: initiative, damage, AC, magic damage, damage resistance and HP, and then there's a whole rock-paper-scissors game of which kind of attack is best against which kind of creature. I think there's room for a lot more of that in D&D - you get hints of it, with items of "giant slaying," and clerics turning undead, but I think it could be taken a lot further: what if your bonus against giants comes with a ban against dwarves or pixies? Ring of protection from fourfoots (all quadrupeds avoid you - includes riding mounts); ring of alacrity (grants initiative bonus); ring of dragonspeech; ring of vampirism (gives you some of the HP you do in damage to others)... Pay Day reminds me of your vulturemen: you knock gold coins out of the opponent. Thanks Richard, a lot of good ideas. Another classic use of rings and other jewelry: soul traps. I love djinn, but I see them more in lamps, or iron flasks. Or maybe something like a lich's phylactery. Because there are those options I don't feel bad about not making them rings. 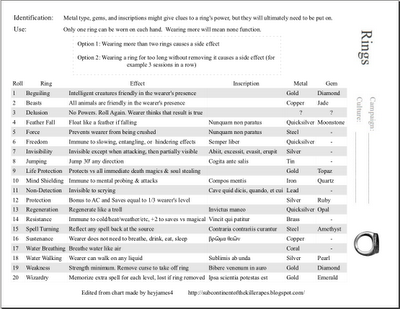 I guess that's the point of this, for me, to "clean up" the items so I don't forget any, so I use them to best advantage, so I make sure things that feel like rings to me are rings in my campaign and things that feel like spectacles are those. Yeah, along those lines I like that blunts do more damage to skeletons. I always wanted to exploit that more with monsters: rubbery monsters that blunts don't do much to but slashing hurts them, etc. The Ring is Actually . . . The Potion is Actually . . .